One of the tenets of the Johnson & Johnson credo is to be responsible to the communities in which we live and work and the world community as well. 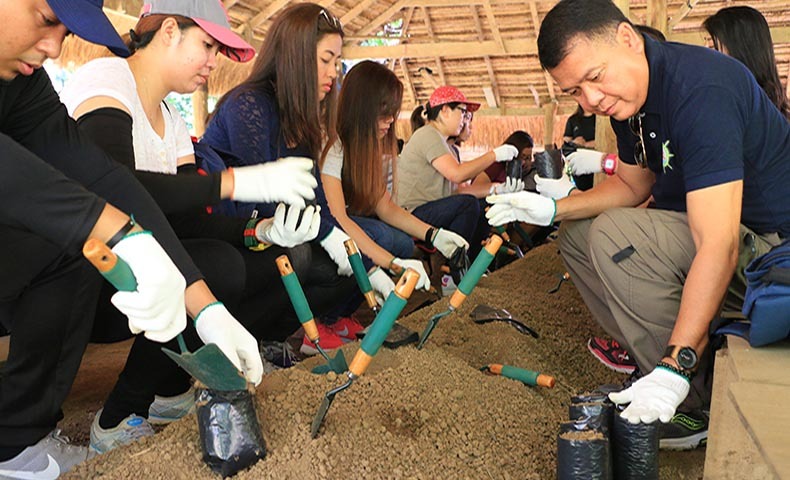 Forty-five employees of Johnson & Johnson Philippines recently created germinant pots and planted 350 seedlings of Cupang trees at the La Mesa Watershed – an employee engagement activity in partnership with ABS-CBN Lingkod Kapamilya Foundation, Inc.’s Bantay Kalikasan. “We have been partners with ABS-CBN Lingkod Kapamilya Foundation for so many years. We believe in what the foundation is doing to help preserve this watershed not only for us but for the future environment as well. That is why this is our little way of saying we care for our environment, we care for our generation, and we care for the coming generations as well,” he added. Potting of soil: The first step in nursery/germination activity. Nuqui lines up his finished pots of soil while other employees prepare theirs. The employee engagement activity also became an avenue for young ones to show their love for the environment. The children of Aquino, took part in the activity as part of celebrating their brother’s birthday. “Our mom said that for all our birthdays, we should start helping the environment rather than making our birthdays all about ourselves. I think it’s a good lesson for us,” Bianca, 14, shared. The La Mesa Project started in 1999. The germination or nursery management is the start to produce new seedlings which will be planted along the La Mesa Watershed’s forest that will soon become trees. Cupang trees are endemic and one of its fastest growing species. The La Mesa Watershed is the source of water of the 12 million residents of Metro Manila. To join Bantay Kalikasan’s activities, visit www.abs-cbnfoundation.com or ALKFI’s facebook page at www.facebook.com/abscbnfoundationkapamilya.